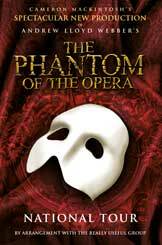 The Phantom of the Opera Tour starts next February in Plymouth with John Owen Jones (who is currently playing the role in London's West End) and Earl Carpenter playing the role of the Phantom with Katie Hall playing Christine. Tour dates so confirmed are: Theatre Royal Plymouth (27 February-31 March 2012), Manchester Palace (4 April-19 May), Bristol Hippodrome (22 May-30 June), Dublin Grand Canal (4 July-4 August), Leeds Grand (8 August-15 September), Edinburgh Playhouse (19 September-20 October), Milton Keynes Theatre (24 October-24 November), Cardiff Millennium Centre (4 December-12 January 2013) and Southampton Mayflower (22 January-16 February). John Owen Jones will open the show at Plymouth and play venues up to Edinburgh Playhouse until 29th September), after which Earl Carpenter will take over on 1st October. Earl Carpenter recently played Javert in the West End production of Les Misérables and appeared in the 25th Anniversary tour of the show. He has already played The Phantom and Darryl Van Horne in The Witches of Eastwick in the West End. His touring credits include Joe Gillis in Sunset Boulevard and he is currently playing Khashoggi, in the tour of Queen’s musical We Will Rock You. The new production is directed by Laurence Connor, with choreography by Scott Ambler, Set Design by Paul Brown, Costume Design by Maria Björnson, Lighting Design by Paule Constable and Sound Design by Mick Potter. The production is overseen by Cameron Mackintosh and Matthew Bourne.